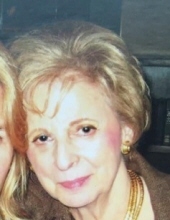 Marcia H. Powers of Rye, NY passed away on January 14, 2019. She was 86. Born in Louville, NY on March 17, 1932 to Albert & Dorothy Wechsler. Marcia was the beloved wife of the late Robert Powers, devoted mother of Dawn Leeds (Husband Andy Parker) and the late Andrew Powers. She is also survived by her dear sister Carol Blatter (Husband Harold) and sister-in-laws Rene Powers and Ann Kern and many beloved cousins, nieces and nephews. A Funeral Service will be held 10am Friday at Community Synagogue of Rye, NY, interment will follow at New Montefiore Cemetery in West Babylon, NY. To plant a tree in memory of Marcia H. Powers, please visit our Tribute Store. "Email Address" would like to share the life celebration of Marcia H. Powers. Click on the "link" to go to share a favorite memory or leave a condolence message for the family.